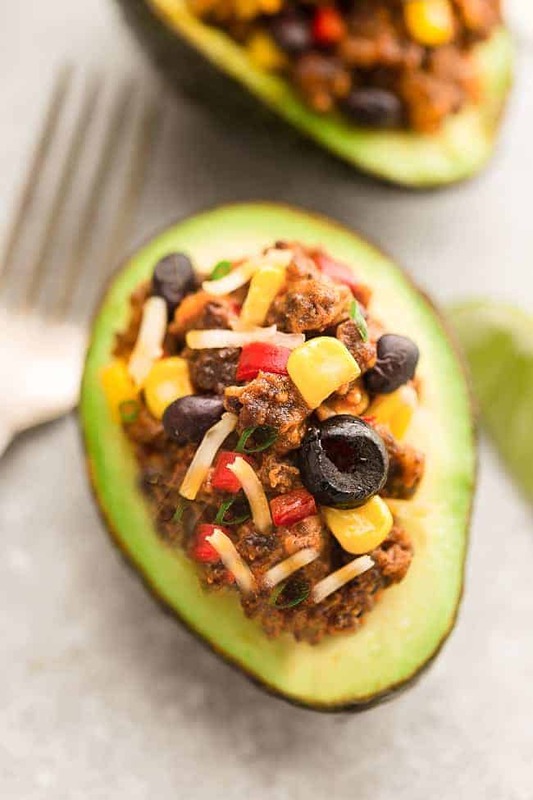 Taco Stuffed Avocado Cups – a fun appetizer based on the classic Mexican favorite and perfect for parties. Best of all, this recipe is gluten free, keto and low-carb friendly. Taco Tuesdays may just be one of our favorite nights. And even if you’re on a low carb diet, you can still enjoy many of your favorite Mexican inspired dishes. 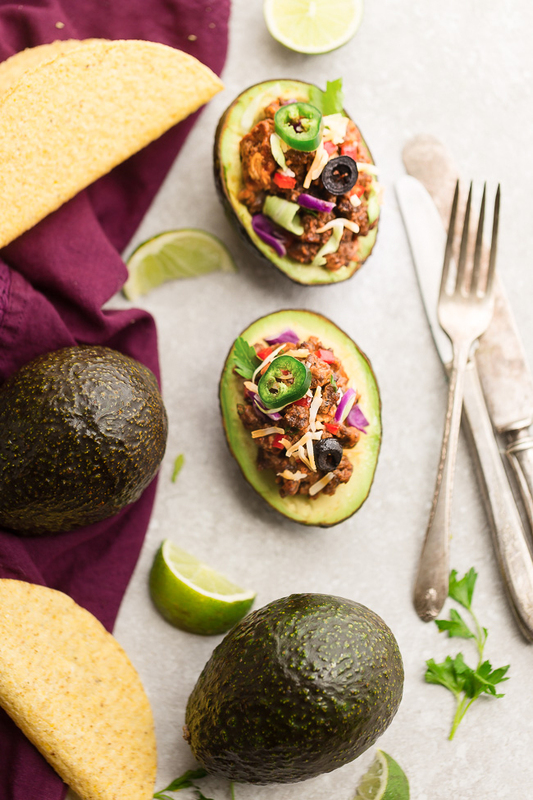 Taco Salads, Enchilada Stuffed Avocado Cups and these Taco Stuffed Avocado Cups. They have all the delicious toppings you love about tacos and make the perfect lunch or light dinner. The best part? You can easily customize them with whatever you have on hand. To keep these low carb, you’re going to use red bell peppers and olives for the filling instead of the usual corn and black beans. If you are not following a low carb diet, feel free to add corn, black beans and diced tomatoes. Next, you add the tomato sauce and taco seasoning until heated through. Remove from heat and stir in the cheese. Split the avocado in half and remove the pit. For a larger surface, feel free to scoop out some of the avocado flesh. Fill each taco half with 2-3 tablespoons of the turkey filling. Sprinkle with additional cheese, shredded cabbage, jalapeno pepper, green onions and fresh cilantro. You can however make the taco filling in advance. Just cook the meat the night before and store in a resealable container. The next day, heat on the skillet for about 2-3 minutes, until heated through and stir in additional cheese for extra gooeyness. 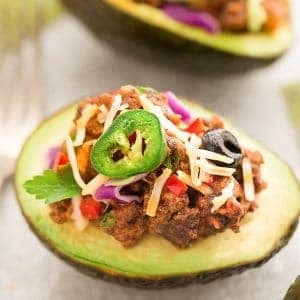 ARE TACO CUPS PALEO AND WHOLE 30? 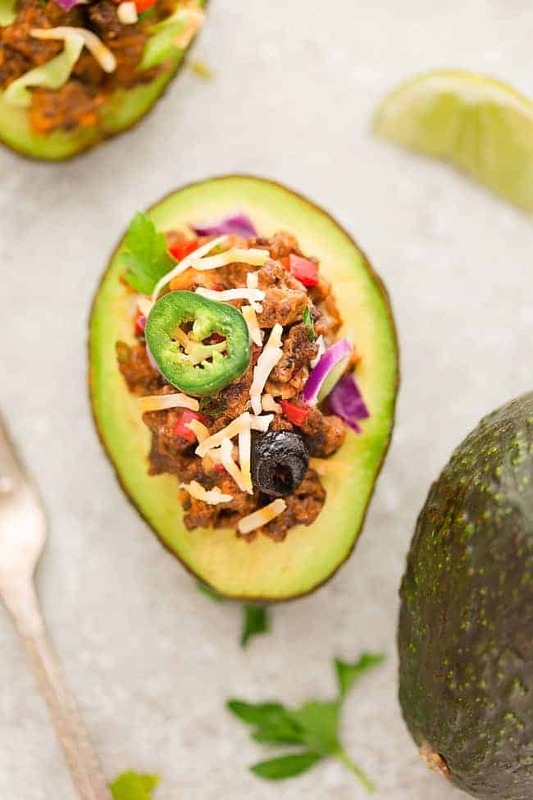 To make these taco cups paleo and whole 30 friendly, be sure to use a Paleo or Whole 30 Taco seasoning and leave out the cheese. In a large skillet, add turkey and brown until cooked through. Drain any grease then season with salt and black pepper. Add bell pepper, olives, tomato sauce, taco seasoning and stir to evenly combine ingredients. Allow to cook for 2-3 minutes, until heated through. Taste and adjust seasonings. Remove skillet from heat and stir in shredded cheese. Fill each avocado half with 2-3 tablespoons of the turkey mixture. Sprinkle with cabbage, fresh cilantro, additional cheese and serve.